Our home is lucky enough to have been getting quite a lot of traction lately, with features on Glitter Guide, SMP Living and Lark and Linen. Each feature is different and if you go to the Glitter Guide post, I spill the beans on a lot of my sources. My favorite thing about the design our home was figuring out how to incorporate my existing pieces into a new house. I had so many treasures from our travels and pieces passed down to me from my family and those pieces were all non-negotiables. They HAD to be in the home. So I used those as my template and added in new pieces and 'new' old pieces to give the place a nice flow and some serious character. Those who know me, know that I don't like to be like everyone else. I read this children's book to my daughter, Coco, called "Different like Coco" which is about the life of Coco Chanel and I can't help but understand how she felt. I have always been different and I imagine I always will be. So I wanted our home to reflect that and I think it has. 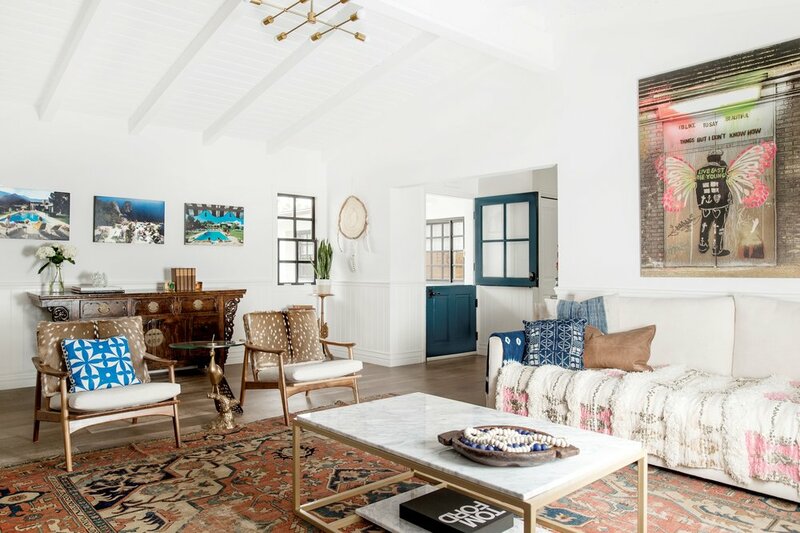 Each room has a few favorite pieces and pieces that mean more than others. In the living room it's the accent chairs that I had recovered in real deer and my favorite antique console table that was my first adult furniture purchase. I got it in the Cotswolds when I was living in England and even though it was entirely too large for my small London flat, I bought it anyway. I just knew that one day I would have a home where it would live happily ever after. This antique butcher block was a total Craigslist score. I go onto Craigslist once a week and type in the things that I am always after. Butcher block, vintage club chair, vintage rug... you get the hint. One by one I have acquired these and the satisfaction is real. That butcher block sells for $1200 in a local high end home decor shop and I scored it for $200 on Craiglist. This Widdicomb dresser from my paternal Grandmother is one of my favorite pieces of furniture. I remember using it in LA when I got my first apartment out of college, mainly because I needed furniture so I went rummaging in my parent's storage unit and out it came. I had no clue back then how cool it was or what good taste she had. I just knew it was free. Now it has taken permanent residence in our master bedroom and I just feel so lucky to be the custodian of this fabulous piece. The bronze gilded art deco lamp I picked up at an estate sale for the former manager of Kareem Abdul Jabaar. It was full of random items but this one I just couldn't leave without. Master Bedroom with my favorite bed, that chandelier I am obsessed with and those rugs! Ok our master bedroom, on purpose, has a majority of my favorite items in the house. That Widdicomb dresser I mentioned, this rattan Anthropologie bed, that classic leather chesterfield sofa and the Ro SHam Bo Malibu chandelier. 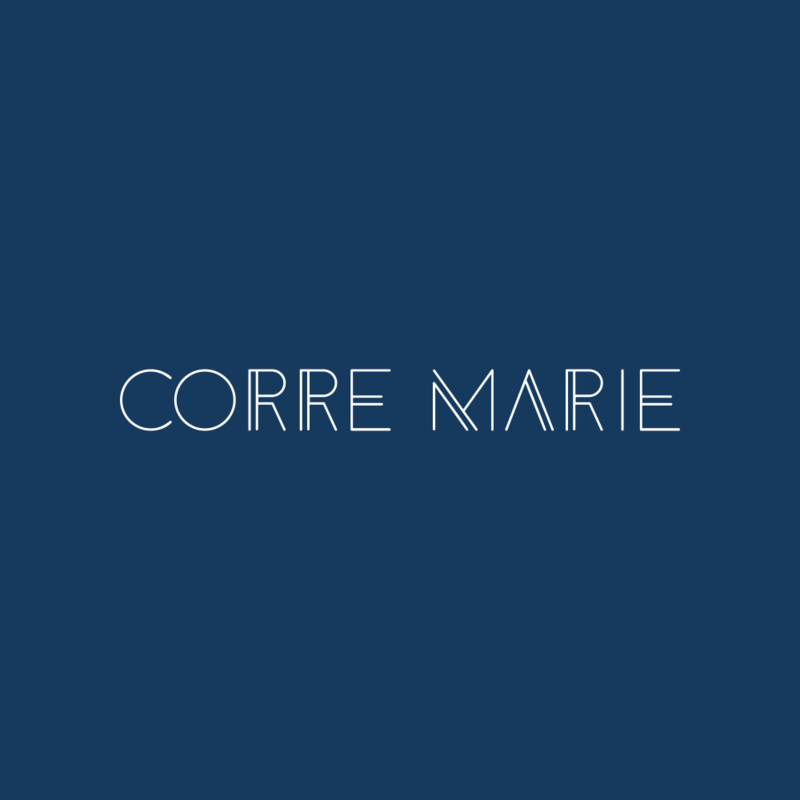 Not to mention the stunning Corre Marie rugs. So let's break this down. If you really love something and can't get it out of your head or find a replacement that is more affordable then get it. But... wait until it goes on sale. Sign up for those email alerts and EVERY shop at some point in the year, has a sale where EVERY item in the store is on included. I waited until that happened at Anthro and the boom, I bought the bed. Next up was the chandelier, which again, I had my eye on and knew I wanted but didn't want to pay full price. So I waited. And once the sale started, I bought it. The couch I had made, see my Glitter Guide article for the source and the rugs are both Corre Marie rugs. Some of my favorite pieces are in our bedroom as it's kind of a no kid zone. Not that my kids aren't allowed in here, but they aren't allowed in there without me. It's my haven and my sanctuary and there is not so much as a sippy cup in sight. The dining room chairs, I get asked a lot about. They are just off the shelf chairs I made much more special by recovering them in the mud cloth. Easiest way ever to ensure you have something cool is to make it yourself. The lights I found in a hotel in Udaipur. Not just any hotel, but the spectacular Udaivilas in Udaipur. These lights were in the rooms we stayed in and before I left I made the manager of the hotel give me the source of the lights. We had a few hours before our flight out of Delhi left and I dragged Matt through the outskirts of Delhi looking for this light man. Low and behold I found him and although his 2 week lead time was actually 6 months, here are my lights! I think I love this story as much as I love the lights themselves. See this day bed? Never have I ever searched so high and low for something.. only to have my best friend who lives in AUSTRALIA yes you heard me AUSTRALIA.. find it within 5 minutes. WTF!!! 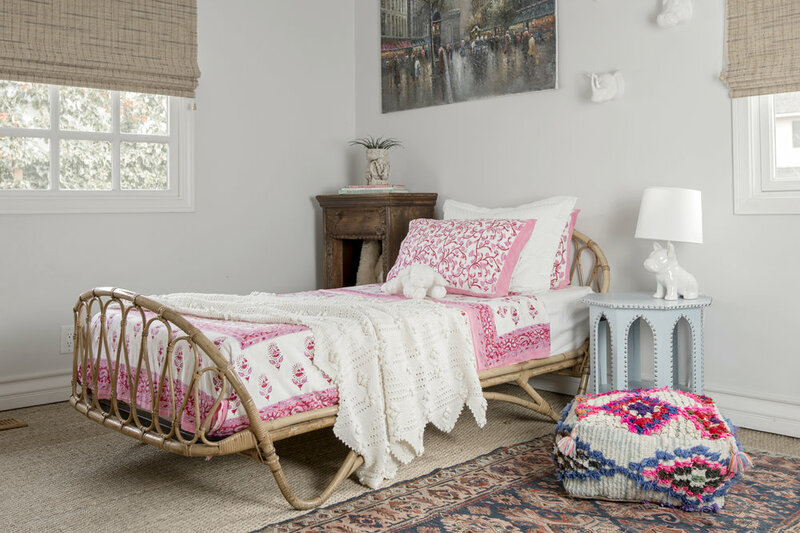 Yes I saw Emily Henderson's Instagram photo of her daughter's nursery with this bed and knew I needed it. But I couldn't find one. Like... anywhere. The Anthro twin bed she gave the source to was not being made at that time and I wanted vintage GDM!! I spent hours and hours late night trolling the internet for this bed or a version of this bed. But no luck... until my incredibly resourceful friend in Oz flitted her fingers over her own keyboard for .2 seconds and found my dream bed. Well... it wasn't even that easy. I went in a waiting list and waited and waited. And then because the shipping was so astronomical from this CA location to anywhere basically outside of CA, I was in! Day bed was mine! And the rest is history. The wing back chair was my Mom's and is part of a pair of which I recovered both. I did this chair about 5 years ago and it was my first foray into recovering anything. I got the antique suzani from ebay and then color matched the arm bits and the seat to whites pulled from the fabric. This chair was my first insight in realizing that maybe... just maybe.. I had the 'eye'. The infamous 'eye' that would allow me to see the end product of this chair while staring at its original version. The antique butcher's rack my parents picked up at an antique shop in Laguna Beach right after they were married. It resided in the dining room of our childhood home and when my parents eventually sold that home, it went into storage and then found it's way to my house. I don't know why I love it so much.. I just do. And I love that it's a bookshelf now, rather than in the kitchen or dining room. Oh this rug. This rug is probably photographed more than any other rug in my entire house. It's also one of my only rugs I own that I will CATEGORICALLY never sell. It's an antique Serapi from the late 1800's and it is what got me into the rug and eventually the interior design business. It's the rug that started it all. I probably love this rug more than any other single item in our entire home. Again, when you find something you love, move mountains to get it. Bear's room has some cool items in there, like the rocking chair I recovered and the cool juju hat. But my favorite part of the room are the floating book shelves filled with my Dad's childhood book collection. My Grandma saved them, unbeknownst of all of us, and they sat in the storage unit covering dust until I discovered them. I love them and I love her even more for saving them. She is has been gone since I was 14 so finding these were EXTRA special. So that's a wrap folks. I figure my house has been doing the rounds on the Home Tours section of a lot of big blogs and it was time it featured on mine. Sorry if you are sick of it by now!! But thanks for stopping by!